Happy Sunday! A number of you have told me that you are anxious for my Instant Pot recipes since many of you know that I purchased one a few months ago (I have the Instant Pot IP-DUO80 model which is their largest 8-quart version). So, while I haven't written up my Instant Pot recipes yet, I do want you to know that I have used it many times and have been enjoying experimenting with it and plan to start posting them in the near future. 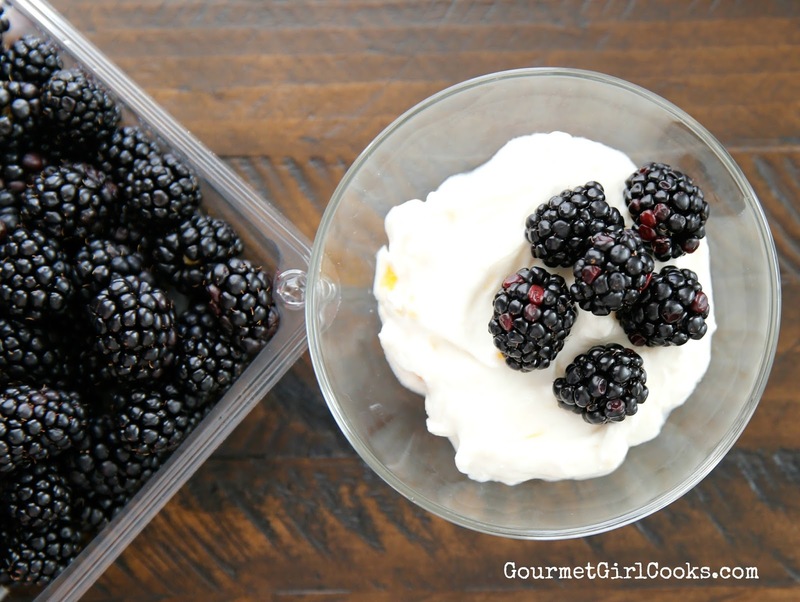 While I don't have this yogurt recipe ready to share with you yet, I thought that since it is what I'm having for breakfast this morning, I'd take a quick photo for you since it just happens to be Greek yogurt that I made using my Instant Pot. I've made it numerous times already and while it is easy as pie to make, it's something that you probably want to make on a day when you are hanging around the house since you need to bring the milk up to a specific temp and often tweak it to get to the right temp. It then needs to cool down to a certain temp before you add starter (fancy word for adding "already made yogurt") and then let it ferment overnight in the Instant Pot. So, while very easy to do, it kind of keeps you close by your kitchen until you get to the fermentation stage which I do for 10 hours in the Instant Pot. I've made it using organic whole milk, 2% milk, etc. and I honestly can't tell much difference between using whole or 2% milk, so I'd use whatever you prefer. So far, every time I've made it, I have made it with 1 gallon of milk because after straining the yogurt to make Greek yogurt, you lose a lot of volume. It was quite shocking to me when I realized how much whey gets strained off; literally several cups of liquid. This batch I'm eating now is made with 2% milk. I swirled a scant tablespoon of no sugar added peach preserves and then topped it with some fresh blackberries. It was delicious. I promise to post my recipe and steps soon. Check out my home made yogurt below. Enjoy! I never drain the whey as that is some really good protein. I do add some "non-fat dry milk" to my milk in the first heating stage which helps with making a thicker yogurt. And I use whole milk because I find the taste and texture (mouth feel) to be better. This looks wonderful. I haven't bought milk in ages, ever since I quit eating cereal in the a.m. But I remember that the organic 2% always seemed much richer than the non-organic 2%. Since WB has been posting more articles lately about how thickeners and emulsifiers can undermine our good "gut" bacteria, I've become more aware of these in products. I found that my favorite Stoneyfield organic yogurt contains pectin, which can be problematic according to Dr. D. Fage, which I also love, doesn't have it. And I've recently discovered Organic Valley "Grassmilk," which is 100% grass-fed organic yogurt with no additives. It's very good and has become my new favorite non-Greek commercial yogurt. Of course, the best thing is to make your own. I've never been very successful at it, but I didn't have an Instant Pot before, either. I'll be quite interested in your recipe. You're definitely not alone. Not everyone can tolerate whey. I seem to do OK with it, but some people do have problems with it. Some can tolerate a little, others none at all. I haven't tried goat's milk myself, but apparently it's much easier on the digestion than cow's milk.